The girls negotiated (between one another), the menu for their 10th birthday dinner and apple pie won as the dessert of choice. Wanting to step it up a bit (due to the birthday), and trying to figure out how the heck I was going to manage all that they wanted on a Tuesday night (after piano lessons, with Grandparents coming over! ), I decided to give this pie a try. 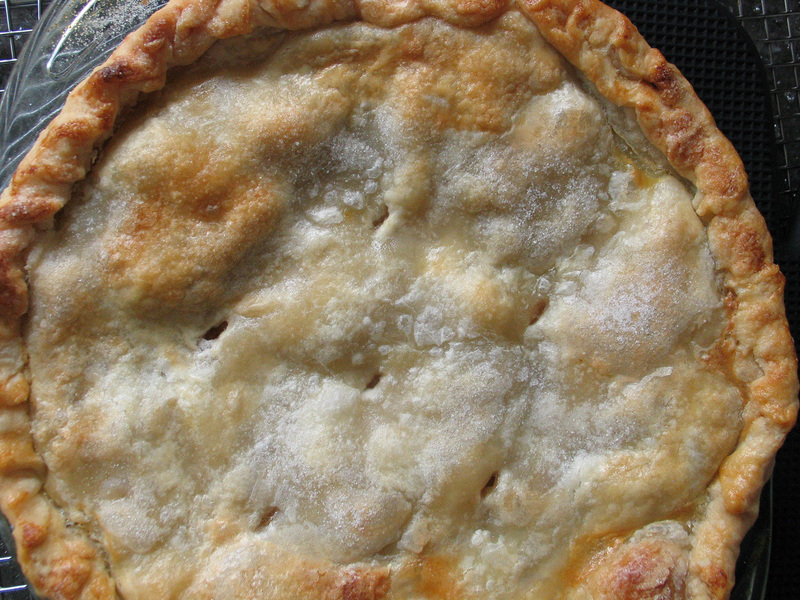 I used Duchess Pastry (made ahead and in my freezer), I made the filling the day before cooking the pie (so it would be cold), and I fully baked the pie and then froze it until the big day. It was divine. To be clear, Deep Dish Apple Pie is still right up there as far as amazing apple pies go…but when you’re in the mood for a perfect classic…this is it. This came from Sam Sifton of the New York Times – enjoy! Plan to make the filling so that it’s either completely cooled to room temperature, or it’s waiting for you in the fridge. Melt the butter in a large skillet and add all of the apples. Stir to make sure all of the apples are coated and then allow the apples to cook while you prep the spices. In a separate small bowl, whisk together the allspice, salt, cinnamon and sugar and then add the mix to the apples, stirring well to combine. Allow the apples to keep cooking for a few minutes until they’ve started to soften and they’re nice and juicy. Sprinkle the flour and cornstarch over the apples, stirring to make sure no white is visible, and then allow the apples to keep cooking for another 5 minutes or so until the juices have thickened. Remove the pan from the heat, stir in the apple cider and then scrape the apples into a bowl to cool completely (or cover them tightly and put them in the fridge for later). When you’re ready to make the pie, preheat the oven to 450, roll out your pastry as you would (be quick if you’re using a butter pastry!) and fit it into the pie plate (deep dish, as usual for me) with a bit extra hanging over the edges. Fill the prepared crust with the cooled apple mixture then cover with the second sheet of pastry, dampen, trim and flute the edges and cut a couple of air vents into the top. Brush the crust with beaten egg, and then carefully sprinkle with the sugar. Bake at 450 for 20 minutes, and then reduce the heat to 350 – this is where I covered the edges with an ‘edge protector’ – and then bake until golden, about 40 minutes. If you’re planning on freezing it, allow it to cool completely, wrap it well and freeze, and then put it in your fridge overnight to thaw the day before you plan on serving it. 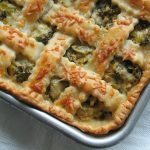 I placed the thawed pie in a warm oven while we ate dinner and it came out perfectly – we also highly recommend serving this up with your favorite Village Ice Cream.